On April 19, I delivered a short opening keynote talk at the EDGE Funders Alliance conference in Berkeley, California, on the challenges facing progressive philanthropy in fostering system change. My remarks were based on a longer essay that I wrote for EDGE Funders, "A Just Transition and Progressive Philanthropy," which is re-published below. Struggle for change within conventional democratic arenas can often be futile, not just because democratic processes are corrupted by money and commercial news media imperatives, but because state bureaucracies and even competitive markets are structurally incapable of addressing many problems. The disappointing Paris climate change agreement (a modest commitment to carbon reductions after a generation of negotiations) suggests the limits of what The System can deliver. As distrust in the state grows, a very pertinent question is where political sovereignty and legitimacy will migrate in the future. Our ineffectual, unresponsive polity may itself be the problem, at least under neoliberal control. Through network-based cooperation and localized grassroots projects, millions of people around the world are managing all sorts of bottom-up, self-provisioning systems that function independently of conventional markets and state programs (or sometimes in creative hybrids). They are developing new visions of “development” and “progress,” as seen in the buen vivir ethic in Latin America, relocalization movements in the US and Europe, and the FabLabs and makerspaces that are reinventing production for use. The new models also include alternative currencies, co-operative finance and crowdequity investments to reclaim local control….transition and indigenous peoples’ initiatives to develop sustainable post-growth economies….the growing movement to reclaim the city as a commons…. and movements to integrate social justice and inclusive ethical commitments into economic life. The scope of this blessed unrest suggests that even as establishment politics continues as if the 2008 crisis never happened, insisting that austerity policies are the answer, the actual terrain of governance, production, social economics and vernacular culture is shifting radically. For those with eyes to see, serious structural changes are underway. The challenge facing members of the EDGE Funders Alliance is how to comprehend these tectonic shifts and develop a fresh vision with practical alternatives. How can philanthropic practices nourish the emerging paradigm of progressive change? For EDGE, this inquiry is a natural progression. EDGE has long focused on the need for a Just Transition that can bring forth new configurations of fair, democratic and inclusive governance and provisioning. Still, the complexity and diversity of the system changes occurring suggest that grantmakers need to explore better ways to make sense of innovation at the edge, and to leverage it more aggressively. Progressive foundations need new venues and tools for identifying the most promising strategic opportunities, reinventing grantmaking processes, and collaborating more closely with vanguard thinkers, activists and policy innovators — as well as communities advancing systemic alternatives on the ground. This essay is an attempt to give better definition to what a process of Just Transition might look like in 2016 and beyond – and how progressive philanthropy might adapt to new realities and support transition efforts around the world. If an old paradigm is indeed waning, then the ways in which we understand new patterns of action cannot unthinkingly incorporate the worldview and vocabularies of The Old. They must reflect a new set of values and operational logics. They must give closer attention to fledging projects and ideas on the peripheries of the mainstream. Our discourse itself must slip the shackles of prevailing economic thought, such as the idea that money and wealth are identical; that the state and policy are the most important drivers of change; and that top-down, hierarchical control structures, whether state or corporate, are the best systems for meeting needs. A diversity of models adapted to local needs. If there is a common thread to be seen in the great variety of movements seeking system-change, it is a rejection of a machine-like economy and Margaret Thatcher’s claim that “there is no such thing as society. There are individual men and women, and there are families.” System-change advocates assert a humanistic vision of society as a living, biodiverse system. Countless social and moral economies stress the importance of stewarding the earth and all living systems; the priority of people’s basic needs over market exchange; and the importance of participation, inclusion and fairness in successful resource management and community governance. The Twelve Principles of Permaculture, for example, emphasize that the whole is greater than the sum of its parts, and that we cannot focus on any separate element in isolation. We must focus on the proper relationships within an ecosystem, of which human beings are but one part. As first principles, permaculturists thus urge that any human interventions aim to care for the earth (so that all life systems can continue and multiply), care for people (so that they have access to resources necessary to their existence), and return any surplus (so that the system can continue to meet the needs of the earth and people). From these ideas flow many related ideas such as “catch and store energy,” “apply self-regulation and accept feedback,” “produce no waste,” and “design from patterns to details.” These principles may provide useful guideposts to funders as they consider what types of projects will “break the frame” of the current system and advance sustainable, humane alternatives. The principles of permaculture complement the design principles for successful commons identified by the late Professor Elinor Ostrom, and highlight the need for focusing on new types of governance. A commons of farmland, a forest or a fishery succeeds, Ostrom found, because people are able to devise their own locally appropriate governance rules from the bottom up. Everyone is invited to participate in the governance, and everyone has access to low-cost conflict-resolution mechanisms. A variety of system-change movements around the world are now exploring ways to re-imagine governance structures – not just for commons, but for the state as well, and its relationship to markets. What’s notable about so many system-change movements is that their sovereign visions of change are incubating on the edges of mainstream politics and policy. They are often small-scale, grassroots endeavors that go unrecognized by conventional political discourse and policies. Even large progressive NGOs may marginalize or ignore these initiatives (as enumerated in Section 3) as too small or disaggregated to matter. Yet just as the best ideas that emerge on Internet platforms generally arise on the edge, where diverse innovation flourishes, so countless grassroots projects around the world serve as indispensable embryos of system-change. They are focused on building out their distinct vision on their own terms, eschewing reliance on law and macro-policy as their primary drivers. The DIY predisposition stems in part from the sheer difficulty of achieving things through government, the general lack of public funding, and the inherent limits of law and bureaucracy in actualizing change. But it also stems from a recognition of the great creative powers of individuals and communities, which the state and market as now constituted have no use for. At both the grassroots level and in digital culture, system-critical organizations are reconfiguring themselves to leverage the power of open networks. Examples include the rise of the peasant farmers’ group La Via Campesina, the System for Rice Intensification (a kind of open source agriculture developed by farmers themselves), and transnational collaboration among indigenous peoples. Rather than trying to manage themselves as hierarchical organizations with proprietary franchises, reputations, and overhead to sustain, they are reinventing themselves as flexible players in open, fluid environments – as players in dynamic, collaborative movements. These new modes of network-driven activism succeed through the efficient self-organization of self-selected participants, supple coordination of activities, and fast cycles of creative iteration. So, today: If we are serious about effecting system change, we need to emancipate ourselves from backward-looking concepts and vocabularies, and learn new ways of understanding social movements pioneering new patterns of human potential, provisioning and governance. Although system-change is often focused on transforming societal institutions and policies, it is equally an inner transformation — a re-examination of the concepts and words to which we have become acculturated. We must learn to change ourselves in light of the unfolding realities. And we need to hoist up new imaginaries as placeholders while we explore the field and experiment with the particulars. Instead of clinging to the old left/right spectrum of political ideology, for example – which reflects the centrality of “the market” and “the state” in organizing society – we need to entertain new narratives that allow us to re-imagine new drivers of governance, production and culture. The challenge is to popularize new models from the edge that are more inclusive, participatory, transparent and socially convivial – ones that go beyond what is offered by electoral politics, the administrative state and market structures. How can the dozens of loosely associated transnational “tribes,” all sharing aspirations for system change, begin to collaborate more closely and federate themselves? Can they create new types of local/global culture and political power? The answers can only emerge through mutual exploration and co-creation. These insights underscore the importance of the long view. It takes time to cultivate emergent structures – to learn from experiments, failures, peers, changing conditions, etc. It is therefore important to hold fast (yet flexibly) to a larger vision of society rather than chase isolated transactional reforms that do not contribute to to transformational goals. Many commentators such as Jeremy Rifkin argue persuasively that we are in the midst of epochal transitions in technology, communications, energy, and so on. With commensurate resolve and intelligence, funders must take full cognizance of long-term structural trends and design grantmaking strategies that assure socially equitable, democratic and ecologically sustainable outcomes..
A major problem in building a “new system” is that so many urgent contemporary problems must be addressed through the “old system” – existing government systems and law; concentrated, extractive markets; and corrupted electoral processes – at least in the short term. No socially concerned person can ignore these arenas of power. Yet it is equally clear that these systems will not self-reform themselves or automatically give rise to the transformational changes needed. Disruptive external catalysts and pressure are essential because “working within the system” tends to diminish the impetus and ambitions for change, as the past fifty years of citizen activism has shown. It is therefore imperative to break the “attention frame” of the existing system of power – in economics, law, politics, culture — which subtly dictates the spectrum of credible, “respectable” options. So long as the neoliberal market/state remains the governing framework for acceptable change, the range of permissible solutions will be inadequate. Only a structural reconfiguration of power and new sorts of institutions will open up transformative solution-sets. And this can only be achieved by artfully engineering, sector by sector, a new socio-ecological economy with its own efficacy, values and moral authority. Thus, along with a grand strategy of “Starving and Stopping” (within the Old), serious support must be given to “Building the New.” This means active, informed support for experimentation, outlier projects, deep conceptual thinking and analysis, strategy convenings, relationship building, and movement-building. It means developing an infrastructure to support an expanding web of learning, institutions and affiliations that help Build and Replicate the New. Since the basic goal is to catalyze a paradigm-shifting emergence (which arises in unpredictable, nonlinear ways), it is misguided to try to apply old-paradigm quantitative metrics to the early-stage instances of a new paradigm. As a matter of practical politics, it is complicated to simultaneously try to dismantle the old system from within while also attempting to Build the New. This is well illustrated by the struggle to develop transition strategies for climate change. Moving away from carbon-based fuels and finance capitalism and towards renewable energy and a post-consumerist economy must take place primarily within the old (corrupted, archaic) political and policy apparatus. But the fight to Starve the Old can be greatly assisted if it is connected to and coordinated with efforts to Build the New. The demonstration of feasible alternatives (renewable energy, cooperativism, relocalization, etc.) is itself a way to shift political momentum and the moral center of gravity toward system change. To work, this requires that alternatives incubated outside the existing system achieve a sufficient coherence, intelligibility, scale and functionality. Two analogues illustrate this dynamic: The rise of Linux and other open source programs were significant socio-economic events because they weakened the market power and stature of Microsoft and other types of proprietary software; suddenly other options were credible and available. Similarly, a constellation of local food and anti-GMO movements, working mostly outside of policy arenas, have pioneered an alternative vision for growing, buying and enjoying food. This has forced agribusiness to change, stimulated new policy initiatives (anti-GMO labeling, e.g.) and shifted the conversation about what’s possible. Political and policy dimensions are not the primary focus but the secondary effects of Building the New. In both of these cases, the impetus for change came from innovative provisioning models; robust participatory communities; and an earned moral credibility that is widely recognized. So rather than regard the Building of the New as too risky or marginal (because it is seen as peripheral to mainstream politics debate and today’s headlines), it is important to see emergent ventures as the real engine for long-term system change. A focus on Building the New is the only way that we can break out of the logic of the current political and economic system, and begin to validate and develop viable alternative systems. Building the New helps us see the limitations of what can be done within the parameters of existing paradigms while opening us up to alternative systems of knowledge and social practice. We need to draw upon diverse ways of knowing and being – culturally, ecologically, politically – as embodied in indigenous communities, peer production networks, ethnic and gender minorities, urban movements, and others. The lessons gleaned from Building the New can be affirmatively used to advance a Just Transition. Two examples: Michel Bauwens of the P2P Foundation is now documenting the thermodynamic efficiencies of peer production (i.e., mass networked collaboration), such as the open design and local manufacturing of motor vehicles, household appliances and countless other products. These findings could help validate a whole universe of actors that are considered fringe phenomena in mainstream climate policy debate. Similarly, various commons activists are documenting how subsistence commons for farmlands, fisheries, forests and water, among other resources, function as more ecologically responsible alternatives to the extractive market economy, while still meeting people’s needs in locally responsive ways. Such commons represent attractive post-growth models. But this theater of action, too, is largely ignored by macro-policy players who prefer capital-friendly pricing of "ecosystem services," “market solutions” and regulatory approaches. Building the New has a special importance in our times because we increasingly live in an institutional void of politics. As Dutch political scientist Maarten Hajer: “There are no clear rules and norms according to which politics is to be conducted and policy measures are to be agreed upon. To be more precise, there are no generally accepted rules and norms according to which policy making and politics are to be conducted.” (original emphasis) The machinery of politics and government still exists, of course, but it has been captured by the large market players and its processes warped. Neoliberal policies have “hollowed out” government over the past generation, literally and politically, by crippling many state functions or transforming them into empty formalisms or distractions. The notional social contract that has stabilized conflicts among capital, labor and the general public is being incrementally dismantled. Many NGOs and movements persist in “working within the system,” gamely hoping that success there will matter. This path is inescapable, of course; The System is too important to ignore. But it is also true, as massive protests in many countries have made clear, that neoliberal capture of representative government is arguably the biggest structural barrier to change today. The resulting void in legitimate governance, intensified by impediments to democratic participation, makes it even more imperative strategically to Build the New as a way to transform The Old. Many citizens who in earlier generations might have engaged with politics and policymaking now see that route as pointless or secondary; they have shifted their energies toward “transnational, polycentric networks of governance in which power is dispersed,” writes Hajer. We thus see the emergence of new citizen-actors and new forms of mobilization seeking system change. This consists not just of periodic cultural surges such as Occupy, the Arab Spring, the Indignados and Syriza, but long-term movements focused on cooperatives, degrowth, the solidarity economy, Transition Towns, relocalized economies, peer production, the commons, and countless niche projects. Voting and other classical notions of citizenship now seem archaic and even futile, especially when contrasted with open Internet platforms and local projects that enable more meaningful forms of participation and results. Much of the political energy for change in the late 1960s and early 1970s came from the invention of a new organizational form, the public interest group – a body of expert-advocates acting as proxies for the general public in various policy arenas, and mostly funded by individuals and institutional philanthropy. In 1969, nearly one-third of the Harvard Law School class applied to work with Ralph Nader in his brand of public-interest advocacy. Nearly two generations later, following the neoliberal takeover of the body politic and the rise of the Internet, creative idealists intent on making social change are far more likely to apply their energies to practical projects in local circumstances and digital apps, wikis and collectives. They are inventing network-based guilds like Enspiral, alternative currencies like the Bangla-Pesa in poor neighborhoods in Kenya, and the Humanitarian OpenStreetMap Team to provide online mapping to assist first-responders after natural disasters. In such spaces, there are simply many more opportunities for participation, control, responsibility and satisfying outcomes than conventional politics and policy. But if the two realms could somehow work more closely together? It could be tremendously catalytic. To be sure, the initiatives of many social entrepreneurs do not necessarily move beyond their niches or transform the mainstream paradigm. The challenge of catalyzing emergence remains something of a mystery and art. However, based on its study of living systems, complexity science suggests that there must be a “requisite variety” before a new order can sufficiently develop and supplant the old. To be able to address the external complexity of the world, the archetypes of the insurgent order must have a corresponding internal complexity of their own; resilience theory and the open source paradigm suggest that the new order will be based on a certain modularity, redundancy and diversity. Finally, as Donella Meadows and her colleagues argue in their 1992 update to Limits to Growth, the old order must not only reach its limits to grow, it must also “run out of the ability to cope” with rising incremental costs, declining marginal returns and soaring (unmanageable) complexity. This analysis suggests some of strategic points of intervention for Building the New and making social change today. We need to learn more about promising new provisioning and governance models – i.e., new organizational forms. System-change players need focal points around which they can organize themselves, build relationships and learn from each other. New “sense-making” projects and institutions are needed to synthesize and interpret unfolding developments. All of these approaches require new modes of philanthropy to support them. But since Building the New is likely to occur in out-of-the-way, unfamiliar and international locations, some timely questions include: What do some of these efforts look like? What are they trying to accomplish? What new logic and vision are they trying to actualize, and how? While this paper has focused on large conceptual themes, it is important to locate the struggle for a Just Transition within a sprawling universe of concrete initiatives. Specific projects pioneered by grassroots innovators and participation are the engines for system change – complemented, as possible, with supportive policy structures and infrastructure. This grassroots base is arguably the first priority because no political advocacy and policy change will succeed or endure without a diversified foundation of locally engaged practitioners. Moreover, experimentation and collaboration are essential in developing the practical new models for change. So….here are brief descriptions of some salient clusters of system-critical movements (among many others that could be named). Building the New poses new challenges for traditional philanthropy because it can be quite difficult to step into the unknown. It’s not necessarily clear how to distinguish between credible and far-fetched plans, or to predict suitable timelines for progress — or even how to define success in a world in which “failure” is often a necessary building block of learning. It can be difficult to make intelligent evaluations of new-paradigm bellwethers, who tend to be idiosyncratic individuals acting in singular circumstances, and among small peer groups and underdeveloped fields. Finally, it can be difficult to assess whether and how a proposed project truly advances system change, or whether it simply modestly improves things within existing structures. There are no definitive answers to any of these concerns, but it is important for grantmakers to ask these questions of themselves and grantees. If we accept the premise that a new paradigm will be emergent, then the process of fostering the new world struggling to be born will be different than known processes. It will be more of an immersive, participatory process of collaborative discovery and co-creation, rather than something that influential experts will design in advance, implement and impose. Open networks have underscored the point that change occurs through many independent agents operating in a holistic living system. It is not just the Earth’s ecosystems that are interconnected, but our cultural behaviors and political institutions. Thus change-making in a globally integrated world is highly dynamic, evolving and participatory. It is necessarily collaborative, not just with other change-agents, but with a larger web of other grantmakers and institutional allies. In light of these realities, the EDGE Funders Alliance is structuring its annual Just Giving gathering in 2016 to be less a conference than a facilitated retreat that actively engages all participants. Traditional workshops will be replaced by ongoing “engagement lab” discussions led by EDGE members and many inspiring and thoughtful civil society partners. In other words, the dialogues between grantees and grantmakers will aim to deepen mutual understanding of Just Transition narratives and practice. The goal is to encourage learning from each other and identify timely, strategic opportunities that promote systemic alternatives at the local, national, and international levels. Instead of segregating initiatives by “issue areas” or movements, it is our hope that the interconnected nature of social, economic, environmental and governance challenges will be highlighted. We hope this leads to closer coordination in moving money for resourcing change. We believe that the struggle to imagine and build a post-neoliberal capitalist system can only emerge through iterative, exploratory processes. It will require many small, decentralized projects that speak to local needs and sensibilities. Top-down policies and infrastructures are often needed to assist this process, but the horizontal connections among frontline innovators, and between them and conventional policy advocacy, must be robust. Orchestrating a better alignment between these two theaters of action – Starving the Old and Building the New – is likely to unleash new self-feeding energies and collaborations and, one hopes, new catchment areas for change. Conventional politics and advocacy will not rally for paradigm-shifting initiatives unless they are allied with outsider visionaries. Conversely, if these visionaries have only thin ties to conventional political and legal players, their bold new ideas may well wither on the vine, unable to protect themselves in a hostile environment. 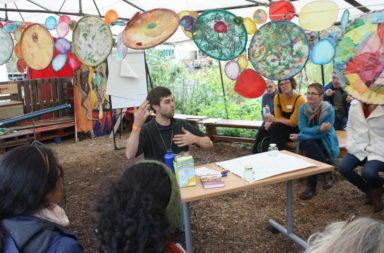 Through its Just Giving 2016 conference, periodic retreats and a Co-Learning Collaborative, EDGE Funders Alliance seeks to instigate better ways to stimulate system-change and promote equity and sustainable practice today, within a framework that recognizes the need for deep social and ecological transformation over the long term. These processes are admittedly experimental and some may not succeed. But intelligent forms of mutual collaboration, learning and support are absolutely necessary in building a philanthropy commensurate with the challenges facing the world. This essay was developed with generous support from the Heinrich Böll Foundation, Berlin, Germany. See, e.g., Oscar Reyes, “Towards a Just Transition: Institute for Policy Studies Working Paper,” January 2016. Margaret Wheatley and Deborah Frieze, The Berkana Institute, “Using Emergence to Take Social Innovation to Scale,” 2006, at http://berkana.org/berkana_articles/lifecycle-of-emergence-using-emergen…. Martaan Hajer, “Policy without Polity? Policy Analysis and the Institutional Void,” 36 Policy Science 175 (2003). See David Bollier, “Reinventing Law for the Commons,” August 2015, at http://commonsstrategies.org/reinventing-law-for-the-commons. Photo credit: Last phase of three stages of catchment, as demonstrated by views of the Nahal Zin keyline in Israel’s mountainous northern Negev Desert, which drains into the Dead Sea. Photos courtesy of Hydrology, University of Freiburg, Germany.